I can't believe this is the fourth post I'm writing about this—"this" being President Obama's $400,000 speaking fee for delivering a keynote at a healthcare conference—but here we are. [Content Note: Video may autoplay at link] Senator Bernie Sanders further criticized President Obama, calling his decision "distateful." Sen. Bernie Sanders believes former President Barack Obama's plan to receive $400,000 for speaking at a September Wall Street health conference is "distasteful," The Vermont Independent reported Friday. Speaking with CNN's Suzanne Malveaux, Sanders labeled the transaction "not a good idea" and said he was "sorry President Obama made that choice." "I just think it does not look good," Sanders said. "I just think it is distasteful — not a good idea that he did that." ..."Look, Barack Obama is a friend of mine, and I think he and his family represented us for eight years with dignity and intelligence," Sanders said. "But I think at a time when we have so much income and wealth inequality ... I think it just does not look good." "It's not a good idea, and I'm sorry President Obama made that choice," he added. Again, this is an "optics" argument: It "doesn't look good." And, again, Sanders is positioning himself in the role of arbiter. He's "sorry President Obama made that choice," as though it's his place to apologize for, or express regret about, the decision someone else made for themselves, no less a Black man. I did a short thread about this on Twitter over the weekend, which resulted in the expected embarrassing invocations of Hillary Clinton, despite the fact she is completely irrelevant to the conversation (except insofar as people only seemed to get agitated about speaking fees set and earned by white men when a woman and a Black man started earning them). There were also the tired accusations that I'm "defending Wall Street," coupled with the usual insistence that Wall Street is unique in its oppressive business practices. In short, there wasn't a coherent argument for why President Obama should not take this speaking fee, aside from the "optics" of taking it from an industry which engages in oppressive business practices. 1. Wall Street is routinely spoken about as though it's a monolith, but that is not accurate. Despite the lax legislation that empowers disgraceful business practices, not all firms leverage that legislation to enact the maximum allowable abuses, which is not incidental. Further, "Wall Street" has become a shorthand for a financial industry model that destroys working class people's lives, which disappears the many working class people who are employed by "Wall Street," most of whom are women and people of color. Receptionists, low-level admin staff, cleaning crews, service staff, maintenance crews. All those big buildings have enormous numbers of support staff. Additionally, demo and construction crews employed for the interior construction jobs when interior spaces are trashed for remodels. There are also many middle-class people who fill "Wall Street" jobs, who themselves in large numbers object strongly to the business practices of the industry by which they're employed. Reflexive hostility to "Wall Street," and anyone who accepts a paycheck from "Wall Street," relies on generalizations that demonize workers for whom the people making those broadsides assert they are advocating. There are ways to resist the oppressive business practices of the financial industry that do not rely on such erasure and demonization. 2. The financial industry is hardly the only industry with detestable business practices that must be challenged in ways more meaningful than a single person not accepting payment for his or her work. 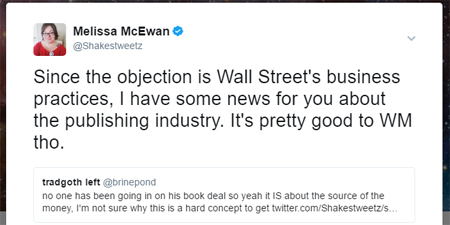 "Wall Street" comes in for outsized criticism because its businesses practices affect everyone, including white men, which is attached to this idea that economic equality (again, not the same as economic justice) is the magic potion to solve all problems, which is itself used to justify a lack of intersectional analysis in economic policy. There are a vast number of entrenched industries which have—and have been built and sustained on—institutional bigotry against marginalized people. People like President Obama, for instance. Ahem. And, if optics matter, it "doesn't look good" when all the other industries that engage in exploitative and exclusionary businesses practices are ignored in order to focus on the one industry that also harms white men outside that industry in a way most other industries don't. But, aside from optics, it isn't good to hold a marginalized person, even a former president, to a standard of rejecting payment from an industry that causes harm when virtually every industry in our capitalist system has caused (and continues to cause) harm to people like him. 3. Even if all the above didn't matter, there is this: Individual solutions to system problems don't work. That is a phrase I've used a lot around here over the years—because it's a central precept of meaningful resistance to institutional oppression(s). A single person, not even one with as much privilege and influence as President Obama, can individually solve a systemic problem. The avarice and abuse endemic to the financial industry is a problem that needs to be solved. It will not be solved by any single person declining a speaking fee from a single entity within that industry. Especially not a person from a community with a historic and persistent wealth gap, which was created by design. Even if one is insistent on (unreasonably) arguing that President Obama has to be first in a series of rejections (that won't fundamentally alter the financial industry's business practices, which are largely defined by Congressional legislation), that argument ignores the message that President Obama stands to convey by not declining this speaking fee: That Black people are worthy and deserving of the same opportunities as white people are. We must be honest here: The call on President Obama to reject a large speaking fee, based on standards set by white men over decades, is to ask him to set aside a meaningful message about Black equality in favor of a symbolic message to an industry that gets disproportionate focus because it harms white men, too. And I know (believe me, I know) that many people will push back on that, and argue some variation on "taking money from Wall Street isn't the kind of equality anyone should want," but you can't simultaneously argue that "Wall Street" is of such enormous significance that it must be uniquely resisted and that visible exclusion on "Wall Street" doesn't matter. If it's that important, then the message of equal opportunities in that space matters. Which is not incompatible with the argument that the rules governing the business practices in that space also need to change. Individual solutions to system problems don't work. It's on all of us to advocate for change, not down to one man. But putting the onus exclusively on one man is a pretty nifty way of absolving oneself of having to do anything meaningful. Pointing the finger at him is a lot easier than getting involved in the slow, deliberate, and often frustrating business of finding real solutions to injustice.